It's not fun when you come home and see water on the floor around your dishwasher. This can indicate that the unit is leaking and may cause serious damage to your kitchen floor- especially if it's hardwood! However, the cause of the problem may not be as serious as you think. 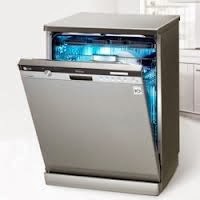 Here are a few trouble-shooting tips for some of the more common causes of dishwashers leaking. 1) You See: Water appears to be leaking from around the dishwasher door. Troubleshoot: Open the dishwasher door, and take a look at the door latch to see if it securely closes. If the door latch is bent or damaged, it most likely does not seal properly, which allows water to run out. Time to call your appliance repairman to schedule a repair! New latch systems can be installed to repair this type of leak. If the door latch appears intact, next you can examine the door seal to check if it is pulling away from the unit, or if it has become cracked. If so, the door seal will need to be replaced. This repair is fairly common, but properly installing a new seal can be tricky- again, call to schedule the repair. If the door seal looks fine, then another possible cause of this type of leaking is that the dishwasher may be over-filling with water. You can take a look at the water float (usually a plastic tube located in the base of the unit) for any damage or apparent clogs. If it is damaged, it will need to be replaced and repaired. 2) You See: Water on the floor appears to be emerging from underneath the dishwasher. Troubleshoot: If you see what looks to be water leaking out from underneath the dishwasher, the cause of the problem could possibly be the dishwasher hose. Hose connections can become loose over years of operation, since they are also subject to wear and tear and can become damaged or cracked. If the hose clamps appear to be loosened or the hose is damaged, it needs to be replaced and repaired. An inlet water valve can also cause excess water to spill out. This valve regulates how much water comes into the dishwasher. It's best to schedule a service call with a certified appliance repair technician to determine if the valve is not working correctly and needs to be repaired. Sometimes the inlet water valve becomes stuck "open," allowing too much water in to the unit and results in leaking or flooding. 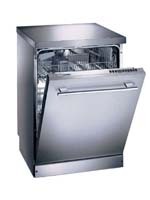 This type of repair can be easily taken care of by your certified appliance repair technician. 3) You See: What looks like a few drops of water on the floor after the washing cycle has ended. 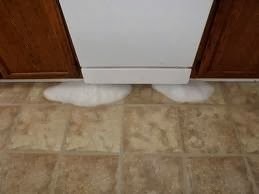 Troubleshoot: It's very common for water vapor to form on the dishwasher door, condense into droplets and then drip down onto the floor. Wait awhile to open the door until the drying cycle is finished (if you use it) or long enough for the condensation on the door to evaporate. Also, it's simple to just wipe the condensation off with a dish towel, if you need to open the door sooner.